Fox News posted an article today stating that Gina Haspel has been confirmed as Director of the Central Intelligence Agency (CIA). She will be the first woman to head the agency. That is fantastic news, but there is another side of the story. The Democrats and some Republicans opposed her nomination because of her role in black sites after 9/11. That is in marked contrast to the confirmation hearings for John Brennan in 2013 when he was President Obama’s choice to head the CIA. Laura Ingraham said Thursday that both President Obama’s pick to lead the CIA and President Trump’s nominee either supported or worked under the policy of enhanced interrogation techniques. Ingraham said that in 2013 at Obama nominee John Brennan’s confirmation hearing, 13 Republicans broke with their party to support his nomination, including Sen. John McCain of Arizona. She said Brennan either supported or was involved in operations involving the techniques which some consider torture. At the same time, Ingraham said Democrats, except for Joe Manchin of West Virginia, are signaling their opposition to Gina Haspel, Trump’s nominee. The opposition to Gina Haspel was strictly political on the part of the Democrats. I have no idea what the motives of the Republicans who played along were. Brennan was in a supervisory role when the questionable activities took place–Gina Haspel was not a supervisor. I am glad to see this lady confirmed–she has served her country honorably. The Daily Caller posted an article today about some recent statements by Virginia Senator Mark Warner. Senator Warner is the top Democrat on the Senate Select Committee on Intelligence. The top Democrat on the Senate Select Committee on Intelligence acknowledged in a recent interview that contacts between Trump campaign associates and Russians could be “a set of coincidences” rather than collusion. “I’m reserving my final judgement until we’ve seen all the witnesses we need to see, and we’ve gotten all the facts. So I’m going to hold off,” Virginia Sen. Mark Warner said in an interview with The New Yorker’s David Remnick when asked whether he believes that Trump associates conspired with the Kremlin to influence the 2016 presidential election. …“I’m anxious for this to come to a conclusion,” Warner said of the investigation, adding that he is “hopeful” that the committee will be able to release sections of its final report every 30 to 45 days. The committee plans to release four separate reports about various aspects of its investigation. The first, which dealt with election security, was released earlier this week. The House Permanent Select Committee on Intelligence has already released a report on its own Russia investigation. The report said that investigators found no evidence of collusion. 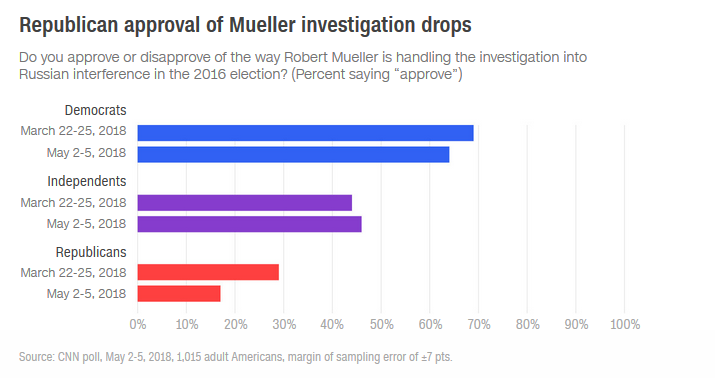 Note that Democrat approval of the Mueller investigation has also dropped (as well as Republican approval). Independent approval has increased, but is still below 50 percent. I hate to be cynical here, but I believe that Senator Warner is simply responding to what his internal polls are telling him–Americans are beginning to realize that Mueller’s investigation was a sham from the beginning. I suspect you will hear more Democrats become reluctant to accuse President Trump of anything as his popularity ratings soar. It is going to be an interesting summer–for many reasons. The Daily Caller posted an article today about a New York federal court case involving the Central Intelligence Agency (CIA). The twisted logic being used by the CIA in the case is simply amazing. That is simply an amazing statement. If the journalists receive the information, isn’t the public also entitled to see it? …“In this case, CIA voluntarily disclosed to outsiders information that it had a perfect right to keep private,” she wrote. “There is absolutely no statutory provision that authorizes limited disclosure of otherwise classified information to anyone, including ‘trusted reporters,’ for any purpose, including the protection of CIA sources and methods that might otherwise be outed. As President Trump continues to drain the swamp, hopefully one of the things his administration will look at is the practice of classifying information that Washington agencies don’t want the public to see for reasons other than national security. It is amazing how much material has come to light recently that was classified only for political reasons–it revealed nefarious activities on the part of the government. The November 13th issue of the Weekly Standard will feature an article by Stephen F. Hayes illustrating how important information was kept from the American public for political gain. The article reminds us that when Osama Bin Laden was killed, the seal team involved collected a lot of computer information about terrorism. A small college library with 571 documents would be pretty pathetic. So what happened? “Thanks to the service and sacrifice of our brave men and women in uniform, the war in Iraq is over. The war in Afghanistan is winding down. Al Qaeda has been decimated. Osama bin Laden is dead,” Obama said in Green Bay, Wis., on November 1, five days before his reelection. No more. On Wednesday, November 1, CIA director Mike Pompeo announced the release of “nearly 470,000 additional files” from the Abbottabad raid. From 571 to 470,000: The “most transparent administration in history,” you might say, has just been trumped, by nearly three orders of magnitude. Among other conclusions I can draw from this information, it might be time to revisit the Iran deal keeping Iran’s relationship with al Qaeda in mind. Wikipedia defines the Government Communications Headquarters (GCHQ) as a British intelligence and security organisation responsible for providing signals intelligence (SIGINT) and information assurance to the British government and armed forces.This group played an interesting role in the 2016 presidential election in America. The American Spectator reported today on some aspects of that involvement. The article at The American Spectator refers back to an article in the U.K Guardian on April 13th. The perspective on the story in the two articles is very different, but both stories have valid points. GCHQ first became aware in late 2015 of suspicious “interactions” between figures connected to Trump and known or suspected Russian agents, a source close to UK intelligence said. This intelligence was passed to the US as part of a routine exchange of information, they added. …Instead both US and UK intelligence sources acknowledge that GCHQ played an early, prominent role in kickstarting the FBI’s Trump-Russia investigation, which began in late July 2016. The Guardian has been told the FBI and the CIA were slow to appreciate the extensive nature of contacts between Trump’s team and Moscow ahead of the US election. This was in part due to US law that prohibits US agencies from examining the private communications of American citizens without warrants. “They are trained not to do this,” the source stressed. I would like to point out that with all this electronic surveillance and all this investigating, there has not been one concrete, proven charge of the Trump campaign working with Russia to impact the election. I would also like to point out that the people in charge of this electronic surveillance in America (the Obama Administration) had a sincere interest in making sure Donald Trump was not elected President. Liberals pompously quote the saying — “the bigger the lie, the more it will be believed” — even as their media enshrine it. Historians will look back on 2016 and marvel at the audacity of its big lie: whispers of an imaginary Trump-Russia collusion that wafted up from the fever swamps of a real collusion between John Brennan and foreign powers seeking Trump’s defeat. I am convinced that collusion between the Trump campaign and Russia does not exist. I am also convinced that the relationship between Hillary Clinton and Russia should be much more scrutinized than it is. Let’s look at some of the history between Hillary Clinton and the Russians. in April 2015, Breitbart.com reported that the chairman of the Russian Nuclear Agency-controlled Uranium One funneled $2.35 million to the Clinton Foundation. This was followed by the Uranium One deal that allowed the Russians to acquire control of one-fifth of America’s uranium. So the mainstream media is trying to tell me that Russia would rather do business with Donald Trump than Hillary Clinton. You can bribe Hillary Clinton. I’m not sure you can bribe Donald Trump. The lesson learned in the contrast between the articles in The American Spectator and the U.K. Guardian is that the media can twist a story in any direction it chooses. It is up to the readers to do the research into the background of the story. Sometimes the best perspective comes from someone who has been there. There are a lot of diverse opinions on the information recently leaked by Wikileaks about CIA techniques. Some media have focused on the invasion into the privacy of Americans, and other media has focused on the damage the leaks do to American national security. On Thursday, Fred Fleitz, a former CIA analyst, posted an article with his observations about the leaks. The article is posted at the Center for Security Policy website. Why did CIA have a cyber warfare office at all? I noted in this December 2016 NRO article that there are cyber warfare offices in four separate intelligence agencies. I suspect this is because different intelligence agencies all wanted to cash in on funding opportunities on a high profile topic. Such overlap is getting worse and make U.S. intelligence more bureaucratic and less efficient. The new leaker was probably hired as a result of CIA Director Brennan’s decision to lower standards for CIA hiring because he wanted to create a more diverse CIA workforce and Brennan rushed to staff his new cyber office. I wrote about this in Investor’s Business Daily in 2015. It also reportedly has been difficult for the U.S. government to find personnel to staff cyber offices who can meet the Agency’s usual security requirements. This probably is why Edward Snowden was hired despite his lack of a college degree and how he was able to increase his access to classified material and move between intelligence agencies despite his poor performance. Did CIA learn nothing from the Snowden leaks on the urgency to compartment information on sensitive intelligence sources and methods? How could another disgruntled intelligence officer have been able to access and leak such a huge number of such documents? This is another area where President Trump needs to drain the swamp and create a more efficient and secure place to keep America‘s secret operations. We will always have a need for the CIA, but we definitely need to be more careful in hiring practices and access to information. Ed Morrissey posted an article at Hot Air today about an event that somehow has escaped the major media. Sabrina De Sousa is a former CIA agent caught up in the legal fight in Europe over the US’ controversial “extraordinary rendition” program. De Sousa, who was freed Tuesday from a Portuguese prison where she was awaiting extradition to Italy, has always maintained her innocence in the case, which was the subject of a sensational 2009 trial. She and 25 other Americans, all but one CIA employees, were convicted in absentia for their roles in snatching an Egyptian cleric off a Milan street and transporting him to Cairo. Hassan Mustafa Osama Nasr, known more widely as Abu Omar, says he was repeatedly tortured while under interrogation there. He was released in 2007 and convicted of terrorism charges in absentia by an Italian court in December 2013. As is often the case involving the CIA, the U.S. government had nothing to say about De Sousa’s reprieve this week. The CIA has consistently refused to comment on the case. A State Department spokesman referred Newsweek to the White House for comment, but officials did not respond to repeated requests for comment. Yet Pete Hoekstra, a former Republican representative and ranking member of the House Intelligence Committee who took up De Sousa’s cause, claims she would not have been released “without extraordinary help from the Trump administration.” Hoekstra told Newsweek he began lobbying officials in the Donald Trump campaign, and later the transition, to do something about the former officer’s predicament. He had a number of friends in the national security apparatus from his time on the House Intelligence Committee—people like Michael Flynn, the recently departed White House national security adviser, fellow former Representative Mike Pompeo, now director of the CIA, and former Senator Dan Coats, the new director of national intelligence. And it didn’t hurt that he had chaired Trump’s Michigan campaign. The Trump Administration prevented a patriotic American (she held dual citizenship in the United States and in Portugal) from being imprisoned for doing her job. De Sousa, 61, a dual U.S. and Portuguese citizen who lives in Lisbon, said she is elated by the last-minute decision, although she feels it came three months too late: Her mother, Julia De Sousa, died in early December at the age of 90. De Sousa couldn’t be with her. The Obama Administration had a checkered record of how they treated Americans who had worked for America overseas. Hopefully, this story is an indication that the Trump Administration will not abandon people who have faithfully done their jobs. Does anyone really believe that the Russians would have preferred the election of Donald Trump for President over the election of Hillary Clinton? It is certainly the most overblown story in a long time. The casual reader of newspaper headlines might well believe that the Russian government hacked into voting machines, or something of the sort, to influence the presidential election. But that is not the case. If you read the Washington Post story, they are merely talking about the well-known hacks of Democratic National Committee and John Podesta emails. The only news here is that someone at the CIA thinks the Russian government carried out the operation and did so in order to help Donald Trump win the election. …The Post’s sources are some combination of Democratic senators and Obama administration officials, conveying their impressions of what what unnamed representatives of the CIA told a bipartisan group of senators in a recent briefing. Someday, persuasive evidence supporting the Post’s headline may emerge, but it certainly hasn’t so far. Another attempt by the Democrats and their allies in the mainstream media to delegitimize the election of Donald Trump. I guess the intelligence community is actually part of the swamp that needs to be drained. It really is time for this to stop. Donald Trump was elected. It’s time to move on. Have the Democrats and the media forgotten that we all live in the same country? This article was originally posted on September 10, 2016. Has anything changed? This is the fifteenth anniversary of the day before 9/11. It is the anniversary of a day when Americans were going about their business—getting children ready to start school, beginning to put away summer clothes and get out fall clothes, and doing fall housekeeping. It was not in any way a noteworthy day. However, there were Americans who understood the threat hanging over us. Unfortunately, those Americans did not have the ability to wake up either our government or the American people. John O’Neill was one of the people who understood the threat. In 1995 John O’Neill was appointed chief of the FBI’s counterterrorism section. When he arrived at FBI headquarters initially, he stayed there for three days. O’Neill was not very diplomatic, but he got things done. He also had the ability to tie loose ends together to see what was coming. Early on in his career, O’Neill became very interested in the activities of Osama Bin Laden to the point where his colleagues began to question his judgement [The Looming Tower by Lawrence Wright Page 237 (paperback)]. He retired from the FBI early in 2001 to become chief of security at the World Trade Center. I have heard stories of the evacuation drills he led at the World Trade Center that probably saved many people’s lives on 9/11. John O’Neill understood that the terrorists would try to destroy the World Trade Center again. He was right. Unfortunately, due to personalities in the FBI, he was no longer in a position to connect the dots and possibly avoid the attack on the Trade Center. So where are we today? What have we learned and what have we done about it? One of the best sources on the failure of the Obama Administration to deal with terrorism is the book Catastrophic Failure by Stephen Coughlin. In that book, Mr. Coughlin details the Obama Administrations inability to understand the root of the threat; and therefore, its inability to counter the threat. I strongly suggest you read the book, but I will try to summarize the main points here. Just a note—Stephen Coughlin is no longer briefing the Pentagon and our law enforcement communities. His briefings were not in compliance with the standards the Muslim Brotherhood placed on such briefings and were no longer permitted. That fact along should give all of us pause. There are some real questions as to whom President Obama listens to on matters of terrorism. Those same questions apply to Hillary Clinton. Would you have put someone with family ties to Hitler in an advisory role to Franklin Roosevelt during World War II? I realize you can’t choose your family, but would the FBI hire a secretary whose father was a Mafia Don to work in their domestic crime bureau? There is substantial evidence that the upper levels of our government have been compromised by the Muslim Brotherhood. One of the most reliable sources for this information is The Center for Security Policy. There are many resources available on their website. So as we look back on this time fifteen years ago, we need to realize that we are still in danger and that the danger we face is getting more serious. The attacks in Europe (reported and unreported) should awaken us to the dangers of allowing refugees into America without proper vetting and the dangers of allowing immigrants who have no intention of assimilating into American culture to set up enclaves within our country. Unless we want to experience a terror attack far worse than 9/11, Americans need to inform themselves about the enemy we are facing. It is obvious that the government is not going to inform us or take care of us. Fred Fleitz is a former Central Intelligence Agency analyst, a former Defense Intelligence Agency analyst, former Chief of Staff to Ambassador John Bolton, and a former Senior Staff member of the House Intelligence Committee. He is currently a Senior Vice President for Policy and Programs with the Center for Security Policy. He posted an article at the Center for Security Policy on Friday about the rise of ISIS and the discussion of ISIS in the current political campaign. Trump is making the point that irresponsible policies by Obama and Clinton led to the resumption of sectarian violence in Iraq which allowed Al-Qaeda in Iraq to rise from the ashes and morph into ISIS. I believe Trump is exactly right. The Obama/Clinton decision not to leave behind a small contingent of U.S. troops in Iraq after 2010 and the power vacuum created by the administration’s failure to lead in the Middle East is why ISIS exists and why it has become a global threat. In my view, Obama’s and Clinton’s incompetence are undoubtedly responsible for the birth of ISIS. The mainstream media does not want to talk about this. It knows ISIS did not exist when President Obama entered office. It also knows that ISIS grew from zero affiliates in 2009 to 43 affiliates today in 18 countries. CNN this morning is jumping on a tweet Trump sent yesterday clarifying that his claim about Obama and Clinton being the founder and co-founder of ISIS was sarcasm. This makes me wonder how dumb CNN thinks the American people are – they obviously knew this. One can argue that a presidential candidate shouldn’t be using sarcasm on such a dire national security issue, but by doing so Trump forced the mainstream media to talk about a subject it was purposely avoiding and encouraged Americans to think about whether Obama/Clinton policies are responsible for the birth of ISIS. Maybe Donald Trump has a better understanding of foreign affairs and the news media than his Democratic and press critics realize. This is the side of the story you probably won’t hear in the mainstream media. On Wednesday, Clare Lopez at the Center for Security Policy posted an article about some of the emerging alliances in the Middle East. Unfortunately, some Middle East countries, feeling that America will no longer stand with them against the Muslim Brotherhood are beginning to align with Russia. Other countries are moving toward other options. At the annual gathering of Iranians outside of Paris, France on 9 July 2016, where some 100,000 showed up to express support for regime change in Tehran, one of the guest speakers dropped a bombshell announcement. Even before he took the podium, Prince Turki bin Faisal Al-Saud, appearing in the distinctive gold-edged dark cloak and white keffiyeh headdress of the Saudi royal family, of which he is a senior member, drew commentary and lots of second looks. The Prince is the founder of the King Faisal Foundation, and chairman of the King Faisal Center for Research and Islamic Studies, and served from 1977-2001 as director general of Al-Mukhabarat Al-A’amah, Saudi Arabia’s intelligence agency, resigning the position on 1 September 2001, some ten days before the attacks of 9/11. He took the podium late in the afternoon program on 9 July and, after a discourse on the shared Islamic history of the Middle East, launched into an attack on Ayatollah Ruhollah Khomeini, whose 1979 revolution changed the course of history not just in Iran, but throughout the world. His next statement sent a shock wave through the assembly: Bin Faisal pledged support to the Iranian NCRI opposition and to its President-elect Maryam Rajavi personally. Given bin Faisal’s senior position in the Saudi royal family and his long career in positions of key responsibility in the Kingdom, it can only be understood that he spoke for the Riyadh government. The hall erupted in cheers and thunderous applause. The Saudi’s understand the dangers of the Ayatollahs obtaining a nuclear weapon. They have also recently moved closer to Israel in a desire to contain the ambitions of the current Iranian government. The NCRI and its key affiliate, the Mujahedeen-e Kahlq (MEK), were on the U.S. Foreign Terrorist Organizations (FTO) list until 2012, having been placed there at the express request of Iranian president Khatami. Iranian university students formed the MEK in the 1960s to oppose the Shah’s rule. The MEK participated in the Khomeini Revolution but then was forced into exile when Khomeini turned on his own allies and obliterated any hopes for democratic reform. Granted protection by the U.S. under the 4th Geneva Convention in 2004, remnants of the MEK opposition have been stranded in Iraq, first at Camp Ashraf and now in Camp Liberty near Baghdad since U.S. forces left Iraq. Completely disarmed and defenseless, the 2,000 or so remaining residents of Camp Liberty, who are desperately seeking resettlement, come under periodic deadly attack by Iraqi forces under Iranian Qods Force direction. The most recent rocket attack on July 4th, 2016 set much of the camp ablaze and devastated the Iranians’ unprotected mobile homes. The MEK/NCRI fought their terrorist designations in the courts in both Europe and the U.S., finally winning removal in 2012. The NCRI’s national headquarters are now located in downtown Washington, DC, from where they work intensively with Congress, the media, and U.S. society to urge regime change and a genuinely liberal democratic platform for Iran. Unfortunately, in 2009 when Iran had a genuine opportunity for a democratic government, President Obama chose to ignore the green revolution. The President was more interested in reaching a nuclear deal with a government that routinely preaches, “Death to America” than helping the Iranian people find freedom. America has become an enemy of freedom rather than a beacon of light in a dark world. Please follow the link above to read the entire article. The media has not reported the full story of Benghazi, and Michael Bay has decided to tell that story. The film documents the contractors’ concerns about security before the assault on September 11, 2012, making clear that the attack was not an isolated incident but the culmination of a long series of hostilities directed at Western targets. Even before the events of that day, viewers are led to understand the difficulty of distinguishing friend from foe. The February 17th Martyrs Brigade, a Libyan militia the State Department engaged and ostensibly the good guys, is filled with shady characters, some of whom seem to know well in advance the plans of the jihadists who attack the diplomatic compound and the CIA annex. Hours before the attack begins, members of the local police force are observed conducting surveillance on the compound. 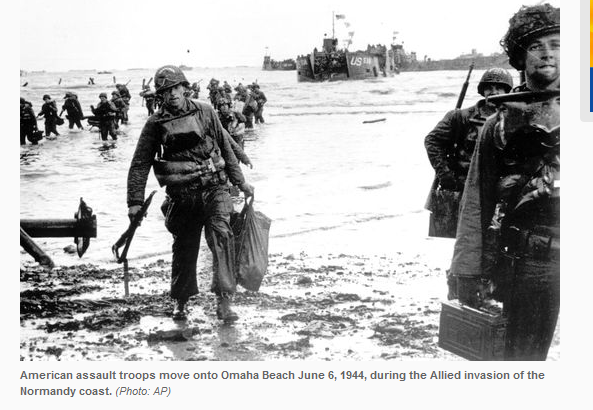 Throughout the hours of fighting at both sites, when the Americans trying to repel the attacks see large groups of dark-skinned, heavily armed men show up to the battle, they cannot determine whether the new arrivals are there to help them or kill them. …Two dominant themes emerge from the film: 1) In the chaos of post-Qaddafi Libya it was impossible to distinguish between good guys and bad guys. And, for that reason and others, 2) the U.S. government isn’t very effective in its efforts to create order out of the inevitable instability that results from removing dictators. The days of the mainstream media smothering the truth and filtering information have been numbered since the inception of alternative media. Now it looks as if there are some in Hollywood who also see the need to tell the truth. Mishandling classified material is a serious crime in government circles. There are severe penalties for infractions. However, it seems like the current administration is taking a vacation from enforcing those rules (other than when the rules involve General Petraeus). Catherine Herridge has posted a story on Fox News today about documents found on Hillary Clinton’s private server. The story reports that the intelligence community has re-affirmed that two emails on Hillary Clinton’s private server were classified “top secret” when they arrived on the server. The agencies that owned and originated that intelligence – the CIA and National Geospatial-Intelligence Agency or NGA – reviewed the emails to determine how they should be properly stored, as the State Department took issue with their highly classified nature. The subject matter of the messages is widely reported to be the movement of North Korean missiles and a drone strike. A top secret designation requires the highest level of security, and can include the use of an approved safe. The sources, who were not authorized to speak on the record, told Fox News that while the emails were indeed “top secret” when they hit Clinton’s server, one of them remains “top secret” to this day — and must be handled at the highest security level. The second email is still considered classified but at the lower “secret” level because more information is publicly available about the event. The findings have been transmitted to the State Department, which continues to challenge the intelligence community’s conclusions about the classification of all the emails. But the department has no authority to change the classification since it did not originate the information. It is time to elect and appoint people to government positions who will put America’s best interests ahead of either political party. Hillary Clinton’s private server was a serious breach of protocol that put sensitive information in the hands of people who are not friendly to America. A private server is much easier for hackers to breech than a government server with layers of security. Putting classified information on a private server was illegal and needs to be handled in a legal matter. I seriously wonder if anyone in the current administration is willing to do that. As of now we do not have equal justice under the law, one of America’s founding principles. That is a serious problem both in this case and in the future. The problem is those pesky emails again–only they are not Hillary’s. Catherine Herridge at Fox News is reporting today that at least two emails were sent to analysts at U.S. Central Command requesting that they ease off negative assessments about the Islamic State threat. Those emails, among others, are now in the possession of the Pentagon inspector general. The IG’s probe is expanding into whether intelligence assessments were changed to give a more positive picture of the anti-ISIS campaign. The former Pentagon official said there were “multiple assessments” from military intelligence and the CIA regarding the “rapid rise” of ISIS in Iraq and North Africa in the year leading up to the group’s territory grab in 2014. Similar intelligence was included in the President’s Daily Brief, or PDB – the intelligence community’s most authoritative product — during the same time period. Yet the official, who was part of the White House discussions, said the administration kept “kicking the can down the road.” The official said there was no discussion of the military involvement needed to make a difference. The IG probe started earlier this year amid complaints that information was changed to make ISIS look more degraded than it really was. National security is not a game–nor is it a political issue–it is an issue that impacts all Americans. I would be somewhat sympathetic if I thought information was sanitized to prevent creating a panic, but I am not sympathetic at all to information being sanitized for political purposes. The investigation needs to proceed without being compromised by interference by the White House or those in the Obama Administration. It was really nice of Vladimir Putin to offer to help out President Obama in the effort to stabilize Syria. The problem may be that both men have very different ideas as to what constitutes a stable Syria. US President Barack Obama said Tuesday that Syrian counterpart Bashar al-Assad must go if the Islamic State group is to be defeated, as he rallied world leaders to revitalize the coalition campaign against the jihadists. …”In Syria (…) defeating ISIL requires, I believe, a new leader,” Obama told the gathering, held on the sidelines of the UN General Assembly. I agree with President Obama that ISIS (the term ISIL President Obama is using denies the existence of Israel) must be defeated. However, if Bashar al-Assad is deposed, do we have any assurance that what replaces him will be either a stable government or a humanitarian government? Are we creating another Libya? Meanwhile, Russia has agreed to help us defeat ISIS. They have moved some serious weaponry into Syria supposedly for that purpose. It is a really interesting move when you consider that Russia’s goal in Syria is diametrically opposed to our goal in Syria. Bashar al-Assad is an ally of Iran. Russia is an ally of Iran. Russia does not want Bashar al-Assad deposed–they would very much like to keep him in power. Under the guise of helping defeat ISIS, Russia has been able to move serious weaponry into Syria that might coincidentally be used to defeat the enemies of Bashar al-Assad. Unfortunately, the enemies of Bashar al-Assad are the troops we are training and supporting. The assessment, which is shared by commanders on the ground, has deepened U.S. anger at Moscow and sparked a debate within the administration over how the U.S. can come to the aid of its proxy forces without getting sucked deeper into a proxy war that President Barack Obama says he doesn’t want. The White House has so far been noncommittal about coming to the aid of CIA-backed rebels, wary of taking steps that could trigger a broader conflict. Vladimir Putin has again successfully eaten President Obama’s lunch. Fox News posted an article today about emails from Hillary Clinton that have now surfaced that have been withheld from the Congressional Committees investigating Benghazi. New documents released by a federal court show President Obama called then-Secretary of State Hillary Clinton on the night of the 2012 Benghazi attack — but the contents are being withheld by the State Department. It had previously been disclosed that Clinton and Obama spoke the night of the terror attacks. But the documents offer additional information about the timing of the call — after the initial attack on the U.S. consulate, but before the second wave where mortars hit the nearby CIA annex and killed former Navy SEALs Ty Woods and Glen Doherty. The article points out that the email in question was discovered as the result of a Freedom of Information Act (FOIA) request by Judicial Watch. Other emails from Judicial Watch lawsuits have, separately, shown Rhodes (Deputy National Security Adviser Ben Rhodes) played a central role in preparing former U.N. ambassador Susan Rice for her Sunday show appearances that weekend where she blamed protests over the Internet video. In that Sept. 14 email, Rhodes specifically draws attention to the video, without distinguishing whether the Benghazi attack was different from protests elsewhere in the region. Thank God for Judicial Watch. It is unfortunate that most Americans will remain totally unaware of any of this and many who are aware will not care about the integrity of a major Presidential candidate. There are a lot of Americans who believe that President George W. Bush lied about Iraq’s weapons of mass destruction in order to get America into a war with Iraq. That is not only not true–to believe it may be dangerous for America’s future. On February 8, Lawrence H. Silberman posted an article at the Wall Street Journal explaining why this misconception is dangerous for the future of America. Please read the entire article to understand the dangers of letting this lie go unchecked. Defending America and American allies should not be a partisan matter. Unfortunately, there are those in Washington who have chosen to make it so. The fact that some Democrats are boycotting the speech of Israeli Prime Minister Benjamin Netanyahu is a disgrace. Israel (and Prime Minister Netanyahu) have a history of successfully dealing with terrorism and of understanding how it works. Israel is willing to share that knowledge. America needs to listen. PJ Media posted a story today that I think ads an interesting dimension to President Obama’s remarks at the National Prayer Breakfast. As you remember, the President reminded us that we should get up on our ‘high horse’ about what the Islamic terrorists are doing because some of the history of Christianity is not so pure–the Crusades, Spanish Inquisition, support of slavery, etc. First of all, the Crusades were a response to Muslim aggression, and the Christians were the ones who fought slavery. …At least 2,464 people have now been killed by US drone strikes outside the country’s declared war zones since President Barack Obama’s inauguration six years ago, the Bureau’s latest monthly report reveals. Of the total killed since Obama took his oath of office on January 20 2009, at least 314 have been civilians, while the number of confirmed strikes under his administration now stands at 456. Research by the Bureau (Bureau of Investigative Journalism) also shows there have now been nearly nine times more strikes under Obama in Pakistan, Yemen and Somalia than there were under his predecessor, George W Bush. And the covert Obama strikes, the first of which hit Pakistan just three days after his inauguration, have killed almost six times more people and twice as many civilians than those ordered in the Bush years, the data shows. The figures have been compiled as part of the Bureau’s monthly report into covert US drone attacks, which are run in two separate missions – one by the CIA and one for the Pentagon by its secretive special forces outfit, Joint Special Operations Command (JSOC). The research centers on countries outside the US’s declared war zones of Iraq and Afghanistan. Yesterday Bloombergview posted a story about the fact that the Justice Department is threatening to bring charges against General Petreaus for classified information found on Paula Broadwell‘s computer. Paula Broadwell was writing a biography of the General, and he has been accused of giving her classified information. My first reaction to this is suspicion of the government. I posted a story in October (rightwinggranny) about Sharyl Attkisson, an investigative reporter who has done a tremendous amount of research on Fast and Furious and Benghazi. Considering the thuggish tactics often used by the Obama Administration, it is very possible that they did the same thing to Paul Broadwell’s computer. So what is this really all about? Paul Mirengoff at Power Line posted a story that provides some interesting information. Petraeus denies that he gave classified information to Broadwell. However, FBI officials reportedly found such documents on her computer after Petraeus resigned from the CIA when news of the affair became public. But it does not appear that the disclosure by Petraeus, if any, resulted in harm to the nation. General Petraeus is going to be called to testify before the Congressional Committee investigating Benghazi. I am inclined to believe that this is a warning shot across the General’s bow designed to control his testimony. I hope the intimidation effort by the Obama Administration fails miserably. Senator Diane Feinstein chose to release the Senate Intelligence Committee majority report of Central Intelligence Agency detention and interrogation after 9/11 yesterday. Today’s Wall Street Journal posted two editorials on the release of the report–one editorial entitled, “Spooks of the Senate,” and one opinion piece by former CIA Directors George J. Tenet, Porter J. Goss and Michael V. Hayden (a retired Air Force general) and former CIA Deputy Directors John E. McLaughlin, Albert M. Calland (a retired Navy vice admiral) and Stephen R. Kappes. It (the report) devotes 6,000 pages to marshalling evidence to indict the CIA program, and nothing was going to interfere with its appointed verdict. Not former CIA directors, who weren’t even interviewed (see the op-ed nearby). Not the virtues of bipartisanship, as the GOP minority staff were reduced to bystanders (see the minority report). And not the requirements of future security, which have been sacrificed to the immediate need to embarrass the agency to prove that Democrats were right. The worst CIA failing in the report is poor management and a lack of adequate oversight. Junior officials were put in charge of detainees when wiser hands were needed, and in one case a detainee died from hypothermia. This may have resulted from the rapid CIA recruitment after 9/11, but it is a major failing, especially given the political backlash that CIA leaders knew was inevitable. The Senate Intelligence Committee’s report on Central Intelligence Agency detention and interrogation of terrorists, prepared only by the Democratic majority staff, is a missed opportunity to deliver a serious and balanced study of an important public policy question. The committee has given us instead a one-sided study marred by errors of fact and interpretation—essentially a poorly done and partisan attack on the agency that has done the most to protect America after the 9/11 attacks. Examining how the CIA handled these matters is an important subject of continuing relevance to a nation still at war. In no way would we claim that we did everything perfectly, especially in the emergency and often-chaotic circumstances we confronted in the immediate aftermath of 9/11. As in all wars, there were undoubtedly things in our program that should not have happened. When we learned of them, we reported such instances to the CIA inspector general or the Justice Department and sought to take corrective action. The country and the CIA would have benefited from a more balanced study of these programs and a corresponding set of recommendations. The committee’s report is not that study. It offers not a single recommendation. I have no idea what the motive for the undertaking and release of such a biased report was. However, it is time to put political bias aside and get down to the business of defending America. The current crop of Washington ‘leaders’ has run up an unreasonable deficit, cut our military back to a dangerous level, and padded their own nests constantly. There are a few exceptions, but the Democrats and establishment Republicans are working very hard to prevent them from doing anything constructive. It is truly time to clean house in Washington. Watch the voting in the House and the Senate in the next two years and cast your vote accordingly. We need to elect leaders who actually represent us–not their own political and private interests. The recently released Senate Select Committee on Intelligence (SSCI) Majority report on the CIA’s Rendition, Detention, and Interrogation Program is marred by errors of facts and interpretation and is completely at odds with the reality that the leaders and officers of the Central Intelligence Agency lived through. It represents the single worst example of Congressional oversight in our many years of government service. Astonishingly, the SSCI Majority staff interviewed no CIA officers responsible for establishing, implementing, or evaluating the program’s effectiveness. Let us repeat, no one at the CIA was interviewed. Worse, the Committee selectively used documents to try to substantiate a point of view where ample and contrary evidence existed. Over 5 years and at a cost of $40 million, the staff “cherry picked” through 6 million pages of documents to produce an answer they knew the Majority wanted. In the intelligence profession, that is called politicization. The SSCI Majority would have the American people believe that the program was initiated by a rogue CIA that consistently lied to the President, the National Security Council, the Attorney General, and the Congress. Nothing could be further from the truth. Nothing. Absent from the report is any discussion of the context the United States faced after 9/11. This was a time we had solid evidence that al Qaida was planning a second wave of attacks against the U.S.; we had certain knowledge that bin Laden had met with Pakistani nuclear scientists and wanted nuclear weapons; we had reports that nuclear weapons were being smuggled into New York City; and we had hard evidence that al Qaida was trying to manufacture anthrax. It felt like a “ticking time bomb” every single day. In this atmosphere, time was of the essence. We had a deep responsibility to do everything within the law to stop another attack. We clearly understood that, even with legal and policy approvals, our decisions would be questioned years later. But we also understood that we would be morally culpable for the deaths of fellow citizens if we failed to gain information that could stop the next attacks. The report defies credulity by saying that the interrogation program did not produce any intelligence value. In fact, the program led to the capture of senior al Qaida leaders, including helping to find Usama bin Ladin, and resulted in operations that led to the disruption of terrorist plots that saved thousands of American and allied lives. Finally, Congress was in the loop. The so-called “Gang of Eight” of top Congressional leaders were briefed in detail on the program. The briefings were detailed and drew reactions that ranged from approval to no objection to encouragement to be even more aggressive. Again, none of this context appears in the Majority’s report. Our views are shared by the current CIA and the Senate Select Committee on Intelligence Republican Minority, both of which have released rebuttals to the Majority’s report. Both critiques are clear-eyed, fact-based assessments which challenge the Majority’s contention in a nonpartisan way. We urge all Americans to read them carefully before reaching any judgments.